If you're in between sizes and have a fuller cup (D+), we recommend ordering the size which fits your bust measurement. The fabric is stretchy. The 50s Mad Men Swing Dress by Stop Staring! 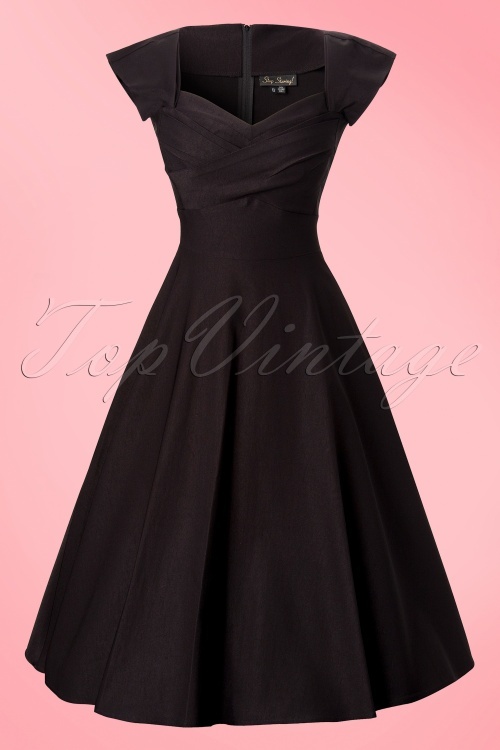 This is a classy 1950's style Mad Men inspired black dress. Elegant timeless dress features a stunning neckline which adds something special: sweetheart neckline with an amazing wrap over, just breathtaking! Suited for a every body type, fuller as well as a more modest cupsize. 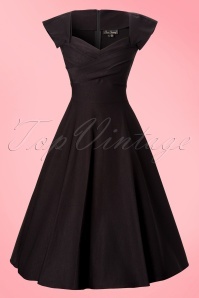 Flattering cap sleeves, fitted top and runs into a full swing skirt which creates an hourglass silhouette. Pair with one of our petticoats for an extra festive look. Made of a thick stretchy black high quality millennium fabric which holds you in and shows you off at the same time and finished off with a zipper at the back. Our black beauty Ava height: 1.69m / 5’7”. Our stunning redhead Miss Victory Violet height: 1.70m / 5'7''. 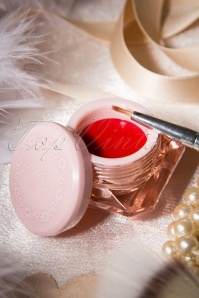 Be fabulous and glamorous! Dutch singer Mathilde Santing wore our dress live on TV and Dutch TV host Bridget Maasland wore our dress in TV programme Showlaat!